December 21, 2018, News! The submission deadline has been extended to January 25, 2019 with the request of many authors. (Click). October 20, 2018, News! The submitted papers have the opportunity to be published in Asian J Pharm Clin Res (AJPCR) which can be indexed by Elsevier, EBSCO, EMBASE, SCI mago(SJR). (Click). October 11, 2018, News! ICPPS 2018 papers have been published in Asian J Pharm Clin Res (AJPCR). (Click). August 25, 2018, News! Prof. Robert Borris from Tianjin University, China will deliver a Plenary Speech in ICPPS 2019. (Click). June 30, 2018, News! ICPPS 2019 will be held in Meiji University and the submission is opened now. (Click). Submitted papers via Electronic submission seystem or conference email box. Abstract should be submitted for presentation only, and full paper for publication. One Best Oral/Poster Presentation will be selected from each session. The Certificate for Best Oral/Poster Presentation will be awarded at the end of each session. 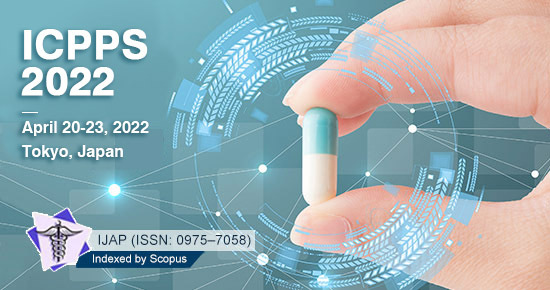 The 2019 4th International Conference on Pharmacy and Pharmaceutical Science (ICPPS 2019) will be held during March 28-30, 2019 in Meiji University, Tokyo, Japan. ICPPS 2019 is to bring together innovative academics and industrial experts in the field of Pharmacy and Pharmaceutical Science to a common forum. The primary goal of the conference is to promote research and developmental activities in Pharmacy and Pharmaceutical Science. Another goal is to promote scientific information interchange between researchers, developers, engineers, students, and practitioners working in Japan and abroad. The conference will be held every year to make it an ideal platform for people to share views and experiences in Pharmacy and Pharmaceutical Science and related areas. Prof. Robert P. Borris is Professor and Vice Dean at the School of Pharmaceutical Science and Technology at Tianjin University. He is a Tianjin 1000 Talents Scholar and the winner of the Tianjin Haihe Friendship Award for service to the people and government of Tianjin. Prof. Tjokorda Gde Tirta Nindhia is Full Professor in the field of Material Engineering at Engineering Faculty, Udayana University, Jimbaran, Bali, Indonesia. His research interest covers subjects such as, Biomedical Engineering, biosensor, biomaterial, waste recycle, failure analyses, advance ceramic, metallurgy, composite, renewable energy, and environmental friendly manufacturing. Copyright © 2019 4th International Conference on Pharmacy and Pharmaceutical Science. All rights reserved.